Blink and you’ll momentarily think you’ve been transported back to Valdez – a similar long dining room and open concept kitchen along one wall certainly caused a sense of déjà vu for me. Of course, there’s been upgrades: the gorgeous wooden arch at the entrance and the emerald banquette seating a comfortable improvement from the stools used in the former restaurant. The menu continues to offer Latin American dishes with a twist. The Nikkei ceviche ($26) is an ideal alternative if you’re not a fan of cilantro as nori slivers are used in lieu of the herb. Cilantro is one ingredient you won’t get away from at Baro – luckily, I love its use. 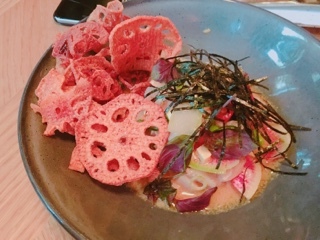 Delicate cubes of Hamachi are seasoned with a tart ponzu and lime mixture with crispy radish slices for interest. Most surprisingly are the tofu cubes and edamame pods mixed with the fish, ingredients not generally found in ceviche but works. 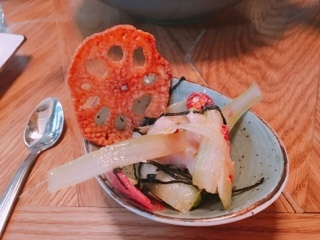 In signature Steve Gonzelez fashion, the accompanying chips were made with a delicious root vegetable (in this case lotus root), its saltiness great for scooping up the citrusy concoction or munching on its own. 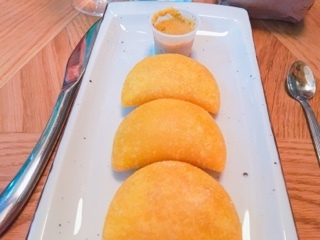 While the empanadas ($7) actually arrive in a paper bag (a cute presentation that also helps soak up excess oil), you have to see these three bite snacks in their full glory. They’re some of the best empanadas I’ve eaten, the corn meal crust slightly sweet and oh so crispy. Meanwhile, the beef, potato, and peas filling is saucy, but thick enough so the crust doesn’t get soggy. On the side, a spicy aji sauce accompanies for dipping, but I rather enjoy them au natural. The chicken wings ($12) were slow to arrive, but worth the wait… especially when they’re blistering hot. 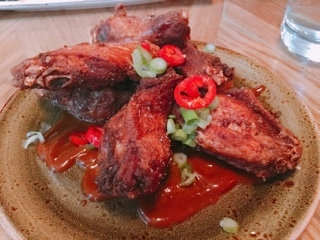 Each fair-sized wing’s coating is incredibly crispy and tossed in a thick smoky guava barbeque sauce. A must-try for wing lovers. A great add-on to a salad is the matambre ($15), a 6 oz. 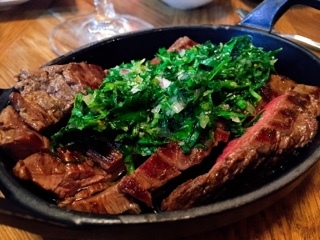 piece of flank steak, which can turn the leafy greens into a complete meal. A roughly chopped chimichurri tops the beef, adding a refreshing element to the steak. sauce... it’s bibimbap gone wild. With a smorgasbord of ingredients including edamame, egg, tobiko and bird’s eye chili, there’s plenty of crunch and flavour. Make sure you share the dish amongst at least three people – it’s a rich affair. 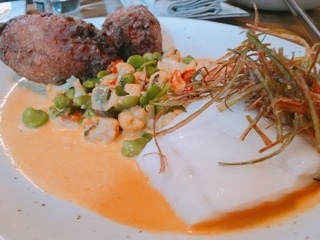 For a more balanced meal, the roasted cod ($32) is a great choice. The fish is simply seasoned and cooked to perfection; much of the flavours comes from the spring succotash and light creamy sauce. Then you bite into one of the sizeable octopus croquettes ­- think of them as seafood paella arinicini - oh what a wonderful crunchy and buttery finish. In my haste to dig into the churros ($7), I forgot to take a picture but they certainly hit the spot – hot sticks of freshly fried dough dusted with enough cinnamon sugar. You could dip to your heart’s content in all the molten dulce de leche, which was salted and perfect for keeping the dessert from getting too sweet. 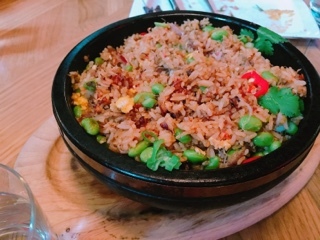 Baro is a lively atmosphere and I could listen to our waitress describe the dishes all night – imagine Sofía Vergara (Gloria on Modern Family) explaining in passionate detail all the ingredients that make up a dish. All the herbs and spices is what makes Baro’s food so great! They’re intense and full of flavours: the ceviche has a tartness that commands attention and the chicken wings tossed in a rich sauce that could go toe-to-toe with a Mexican mole. Seductive flavours that make you want to eat up ever last bit of each dish, a Latin love affair with food.